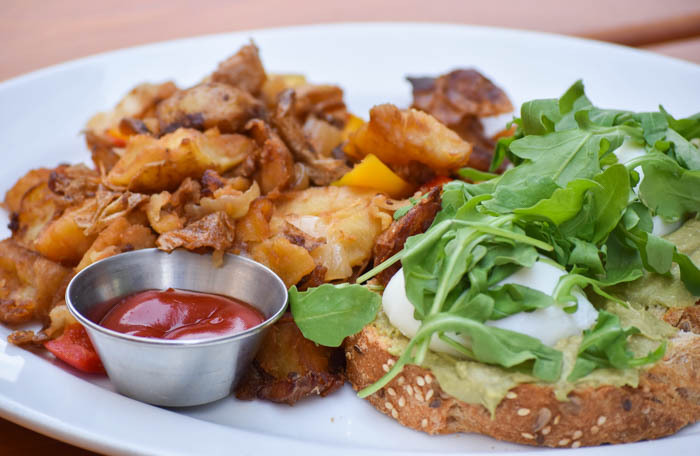 Looking for a cool new place to brunch this weekend? 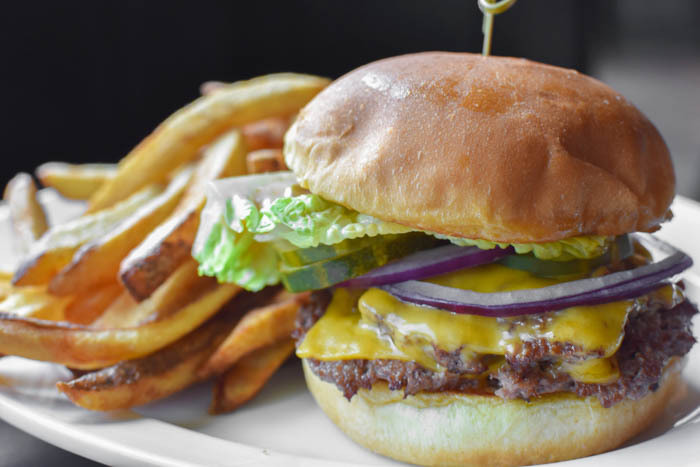 Head on over to Owen’s Ordinary in North Bethesda for classic American cuisine that won’t disappoint. We had the pleasure of dining there last weekend, and their food was anything but ordinary. In addition to the many enticing noms listed, their beer program, curated by Greg Engert, was composed of 50 rotating drafts and 200+ bottles, which included upwards of 75 local MD beers, many of which were only available at Owen’s. We started our meal off with cocktails and sipped on them leisurely while perusing their weekend brunch menu. We got a trio of delish alcoholic drinks to start, and FYI, you can make any brunch entree bottomless for an extra $15. 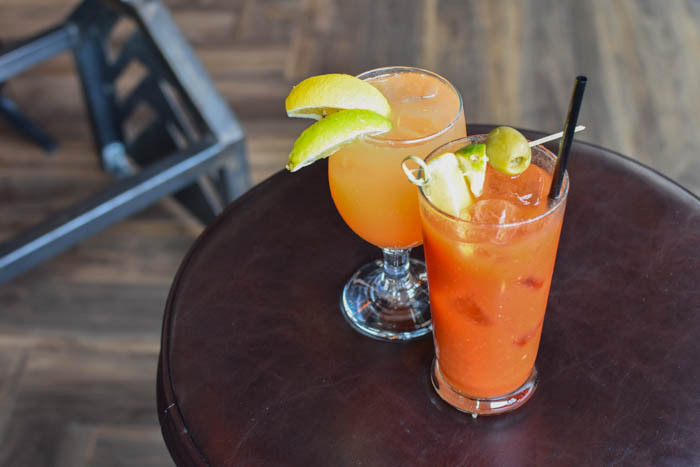 Choose from a handful of different mimosas (cranberry, classic orange, pomegranate, or blood orange), summer brunch punch (made with white rum, orange, pineapple, cherry, and lime), or their old bay bloody mary (made with tito’s vodka, made from scratch old bay, and bloody mary mix). We got two apps and shared because sharing is caring. We got their chipotle barbecue chicken wings ($9), but they have other flavors as well aka serrano-pineapple and habanero cilantro glaze. As you can see, these magical morsels of goodness were served with not one, not two, but FIVE incredible dipping sauces. 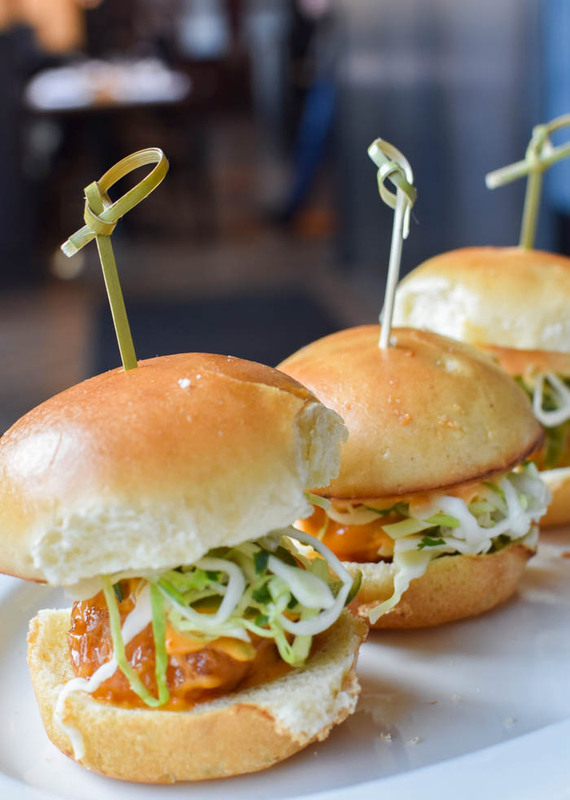 The other app we got was *drum roll please* their crispy shrimp sliders ($12). 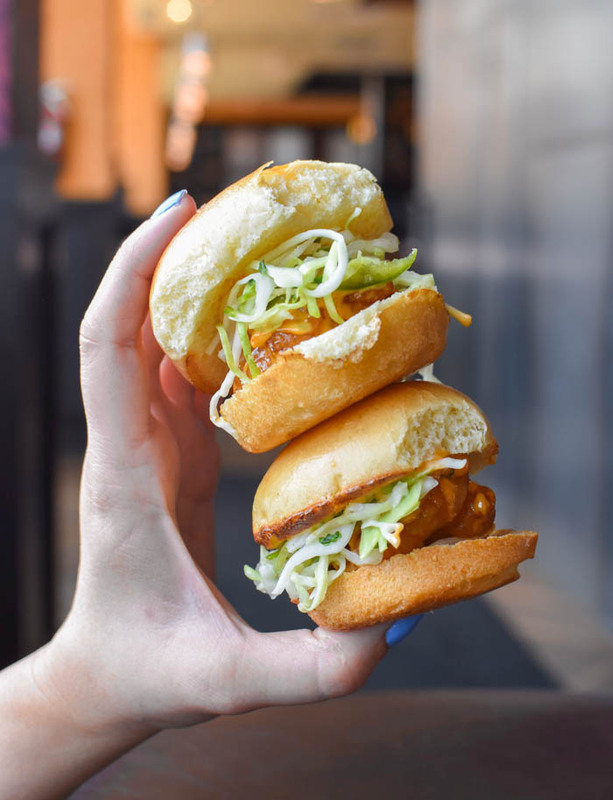 Perfectly fried shrimp, spicy mayo, cabbage and pickled jalapeños on mini-buns? Um, we think yes. Then came our entrees. We ordered 5 plates between the two of us because brunch is serious business – in all seriousness though, don’t judge…too hard, ha! 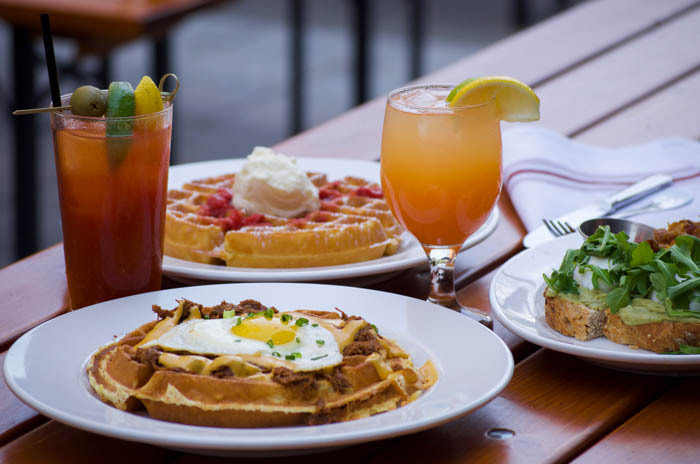 Let’s start with the first 3 dishes pictured below: the strawberry-rhubarb waffle ($12), the californian benedict ($13), and the barbacoa & corn waffle ($16). Everything was delicious, but the barbacoa & corn waffle was the clear standout because of it’s unique flavor profile. What can we say? We’re suckers for interesting combinations! Topped with nacho cheese and an extra yolky egg, this waffle was a savory do on every level. Next up: the californian benedict, poached eggs served on multi-grain bread with avocado, feta, sunflower seeds, and arugula. If this entree doesn’t tickle your fancy, no worries. They have 7 other benedicts so you have a lot of nomtastic options to choose from, and each plate comes with a side of house made home fries. 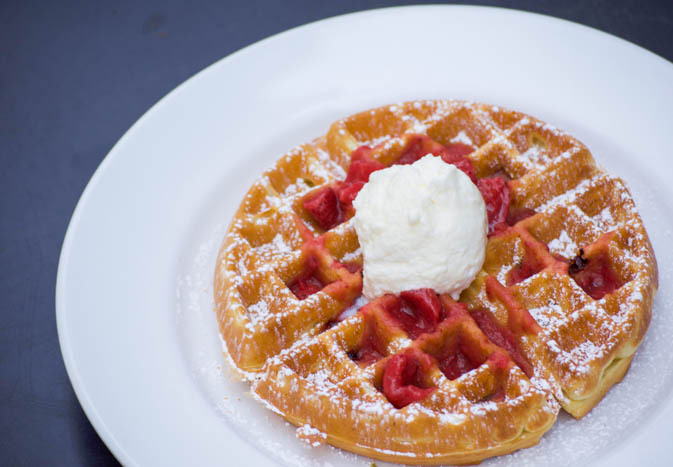 Last but not least, the strawberry-rhubarb waffle. This classic comes with whipped cream and powdered sugar, and is a total must for those of you who enjoy sweet brunch entrees. The next two entrees we got were more lunch-y: the bucatini & mushroom bolognese ($18) and the local angus double stack ($13.50). The burger was good, but the pasta stole the show! The noodles were cooked to absolute perfection, and the sauce to pasta ratio was on point. If you’re a fan of all things mushroom, drop everything you’re doing right now and drive to Owen’s because you need this dish in your life. 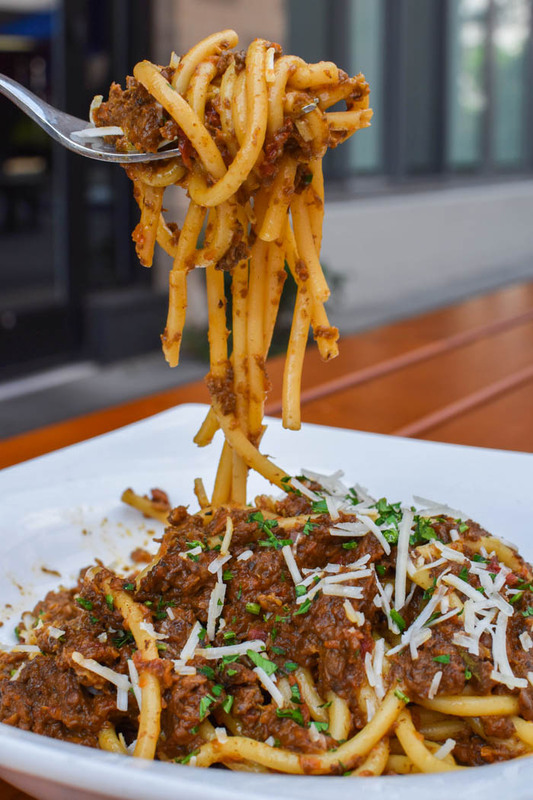 We’re not messing around when we say it’s good – it’s literally one of the best pasta dishes we’ve had in the DMV! Anddd that’s it for today, nomsters! If you’re looking for legit classic American cuisine that slays, hurry over to Owen’s Ordinary for a great experience. It’s still nice out so you can take full advantage of their outdoor dining space if you so desire. Also, there’s a garage right next to the restaurant, but we recommend parking in the Chipotle lot across the street because it’s more convenient! ‘Til next time. Next Post Home SF: Incredible Brunch Round 2! 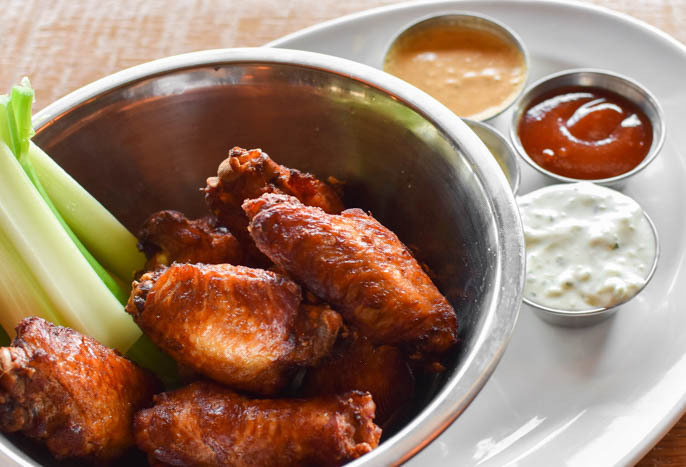 I’m a sucker for dipping sauces – those wings sound amazing.